Imagine, by means of the combination possibilities of the fabrics up to the table, their model optically inside. 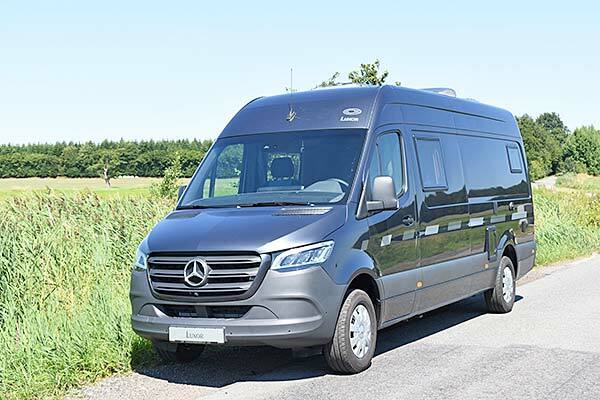 The CS Luxor is delivered with a 4-cylinder diesel engine with 163 HP (120 kW) as standard equipment, allowing for a comfortable and reliable driving experience. For top-end power it is also possible to order the Luxor with a 3-liter V6 CDI engine with 190 HP (140 kW). Next to our standard equipment we also offer a wide variety of optional equipment for the base vehicle. This ranges from four-wheeldrive through LED-headlights to multimedia systems. The Luxor also comes with a special suspension that includes enhanced stabilizers and shock absorbers, which further increases your safety while driving. The cleverly designed seating area allows for a comfortable amount of space for each passenger. In order to make the compact base vehicle feel more spacious on the inside, we opted to design the interior furniture with a wide walkway, a bright and friendly living space as well as excellent ventilation. A large skylight as standard equipment is the natural choice for that. The skylight, as well as all the windows, are insulated and come with integrated fly net and blind. It is also possible to order additional skylights and windows as optional equipment. The Luxor has two lengthways beds in the rear, allowing for a luxuriant bed size for a camper van of this size. Additionally, it is possible to install an additional mechanism below the bed on the co-pilots side, which allows the bed to be lifted up. Thanks to this mechanism, you can transport bikes or other large baggage. It is possible to install a television and / or an oven above the fridge. The television can be moved around thanks to its special mounting, allowing you to see it from both the front seats as well as the bed. Because our vehicles are built by hand, we have full control over the interior design of the vehicle. This allows us, for example, to remove the wardrobe and instead enlarge the wet room with a separate shower. We can also change the shape of the bed to increase its size even further. Furthermore, we can also split up the overhead locker above the driver's cabin into two smaller lockers on each side, giving you more space when driving. All of our furniture is made of 15mm poplar plywood with a high quality HPL front. Both the ceiling and the walls use a microfiber cloth covering. We use solid wood edges for all our furniture. It is also possible to order the table in the seating area in a foldable, solid wood variant. Solid wood frames are also available for all the windows. Extra space for shampoo bottles etc. The large, more than 2,000 l storage space below the bed can store camping equipment, chairs, sporting equipment and possibly even bicycles. All prices include 19 % VAT. Clicking this Icon opens the picture view! If you wish to have your wish vehicle assembled, send us this mail and we will make you an offer! Our precautionary measures for protecting your data is on the highest level of technology. We do not collect any personal data in our homepage without your agreement. Your information will be used for the purpose of contacting you so that we can get in touch with you for answering your questions or giving some special informations / offers to you. The data will be treated in strict confidence and will not be given to third parties. We will delete your data if you wish to. Please click on the pictures for a bigger image.The pictures show different endowments. Every vehicle is built individually after your wishes!